My SIL had these on her menu plan on week and I had to steal the recipe from her! I love these bread sticks. They are quick, easy and so yummy! 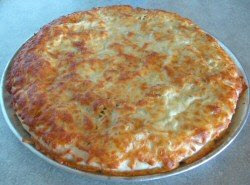 We make these once a week to go with Italian dishes or sometimes with our Homemade Pizza! Note: We have run out of thyme and oregano. The bread sticks are still wonderful without those ingredients! In a bowl, combine the first four ingredients. Combine water and oil; add to flour mixture. Add additional flour if needed to form a soft dough. Turn onto a floured surface; knead for 1-2 minutes or until smooth and elastic. Place in a greased bowl, turning once to grease top. Cover and let rise in a warm place for 20 minutes. Punch the dough down. place on a greased 12" pizza pan and pat into a 12" circle. Brush with salad dressing. Combine the seasonings; sprinkle over top. Sprinkle with cheeses. Bake at 450* for 15 minutes or until golden brown. Serve warm. From Tracy's Recipes. Yummy! Yummy! Honey Whole Wheat Bread!